Gin rummy, or simply gin, is a two-player card game created in 1909 by Elwood T. Baker and his son C. Graham Baker. According to John Scarne, Gin evolved from 19th-century Whiskey Poker and was created with the intention of being faster than standard rummy but less spontaneous than knock rummy. John Scarne's theory deriving Rummy from Poker through the medium of Whiskey Poker has not gained general acceptance. Gin is played with a standard 52-deck pack of cards. The ranking from high to low is King, Queen, Jack, 10, 9, 8, 7, 6, 5, 4, 3, 2, Ace (kings over aces). The objective in gin rummy is to score points and reach an agreed number of points or more, usually 100, before the opponent does. The basic game strategy is to improve one's hand by forming melds and eliminating deadwood. Gin has two types of meld: Sets of 3 or 4 cards sharing the same rank, e.g. 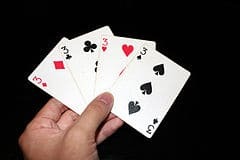 8♥ 8♦ 8♠; and runs of 3 or more cards in sequence, of the same suit. e.g. 3♥ 4♥ 5♥ or more. Deadwood cards are those not in any meld. Aces are considered low - they can form a set with other aces but only the low end of runs (A♠ 2♠ 3♠ is a legal run but Q♠ K♠ A♠ is not). A player can form any combination of melds within their hand, whether it contains all sets, all runs, or both. A hand can contain three or fewer melds to knock or form legal gin. The deadwood count is the sum of the point values of the deadwood cards - aces are scored at 1 point, face cards at 10, and others according to their numerical values. Intersecting melds are not allowed; if a player has a 3-card set and a 3-card run sharing a common card, only one of the melds counts, and the other two cards count as deadwood. Dealership alternates from round to round, with the first dealer chosen by any agreed upon method. The dealer deals 10 cards to both players, and then places the next card in the deck face up. This begins the discard pile. The face down pile is known as the stock pile. On the first turn of the round, the non-dealing player has first option of taking the upcard on the discard pile or passing. If the non-dealing player takes the upcard, the player acting second can take the top card from the pile of his or her choice. However, if the non-dealing player passes the upcard, the dealer is given the opportunity to take the upcard or pass. If the dealer also passes, the non-dealing player must draw from the stock pile, then the next turn and after, players can draw from the pile of his or her choice. On each turn, a player must draw either the (face-up) top card of the discard pile, or the (face-down) top card from the stock pile, and discard one card from his or her hand onto the discard pile. Players alternate taking turns until one player ends the round by knocking, going Gin, or until only two cards remain in the stock pile, in which case the round ends in a draw and no points are awarded. The game ends when a player reaches 100 or more points (or another established amount). In tournament rules the game is played in best of five with 250 points per game. In standard gin, only a player with 10 or fewer points of deadwood may knock. Knocking with 0 points of deadwood is known as going Gin or having a Gin hand, while knocking with deadwood points is known as going down. To knock, the knocking player discards as usual, announces knocking (generally by simply placing a discard face down), and the hand is laid out with the melds clearly indicated and deadwood separated. The other ("defending") player is then entitled to lay out any melds in his or her hand and can then lay off any of his or her remaining deadwood cards that fit into the knocking player's melds, provided that the knocking player does not have a gin hand. For example, the knocking player has a meld of three Kings. The defending player's deadwood has a king. The player can lay off that king, reducing the deadwood count by ten. The knocking player can never lay off his or her deadwood into the defending player's melds. Once a player knocks or declares gin the round is over and scores are tallied, players cannot draw. The knocking player then subtracts deadwood points from the defending player's deadwood points. The result is the number of points the knocking player receives. An undercut occurs if a player knocks and the defending player's deadwood points are less than or equal to the knocking player's. In this case the defending player receives an undercut bonus (usually 25 points) plus the difference in deadwood points. If the defending player has less or equal deadwood to the knocking player's deadwood after laying off any of his or her deadwood, then it is still a valid undercut. If all 10 or 11 cards in a player's hand fit into melds and thereby the player has no deadwood, he or she can choose to go Gin in which case the round ends and the player going Gin receives a Gin bonus of 25 points (or another established amount) plus any deadwood points in the opponent's hand. The defending opponent can only lay out his or her melds and cannot lay off any deadwood into the melds of an opponent that has declared Gin. A player can go Gin with a hand of three or fewer melds as long as all cards fit into a meld. Gin hands normally consist of 10 cards. However, if a player chooses to draw so that 11 cards fit into melds, he or she can declare Big Gin in which case the player receives a Big Gin bonus of 31 points (or another established amount, commonly 50 points instead of the standard 31 points, depending on rule set) plus any deadwood in the opponent's hand. After a player knocks, and the lay offs are made, the knocking player receives a score equal to the difference between the two hands. For example, if a player knocks with 8, and the defender has 10 deadwood points in his or her hand after laying off, the knocking player receives 2 points for the hand. After going gin, a player receives a bonus of 25 points plus the entire count of deadwood in the opponent's hand. There is no chance to lay off when a player goes gin. Once a player has acquired 100 points (or some other agreed-upon number) the game is over, and that player receives a game bonus of 100 points (or another agreed-upon number). Added at the end of the game. For every hand a player won during the game, 25 points is added to their score. If a game is completed with the winner having won every hand, the points for each hand are doubled before adding the line bonus. In Straight gin players are required to play until one of them can go gin. Knocking is not allowed. Scoring and rules remain the same as standard Gin Rummy. Similar to Straight gin, knocking is not allowed. However, more than one card may be taken, in order, from the top of the discard pile. If more than one card is taken, the lowest position card taken must be used in a hand(i.e. <bottom> 8♠ 3♥ 5♥ <top of discard> 8♠ is the lowest position card and must be used in a hand; continue with 1 discard). Cards are shown to the table, with opponents being able to add on to straights of the same suit or finish a three of a kind with the fourth card for points. After a player has gin, points are added, with cards on the table being added up and cards in hand being subtracted. The player, who gins receives 25 addition points, 2-9 = 5 points, 10-K = 10 points, A = 15 points. In this version of Gin Rummy, the value of the first upcard is used to determine the maximum count at which players can knock. Face cards count as 10; aces count as 0 (no knocking allowed, players must play for gin). If the upcard is a spade, the hand will count double. 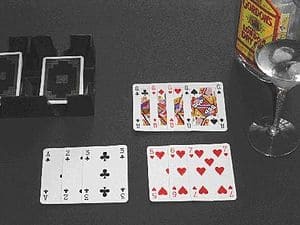 Another version in this variation (mostly in match play) and in Hollywood Gin (see below), a second deck of cards will be used to determine the knock value of a hand. The knock value card will be dealt from the bottom and turned over on top. Above rules apply but both players are dealt ten cards with the last hand winner picking first from the deck. This is a scoring style, not a rules change to the game of Gin. In Hollywood Gin scoring is kept for three different games at the same time. A player's first win will be recorded in their column in Game One. A player's second win will be recorded in their columns for both Game One and Game Two. Their third win will be recorded in their column for all three games. When a single match is to be played, the players will continue to play rounds until one player has 100 points or more. This player wins the match. 100 bonus game points to the match winner if the loser won no rounds. Stu Ungar, widely regarded as the greatest gin rummy player of all time, described by many as having a clairvoyant ability to see his opponents' hands. Bill Ingram, winner of the International Gin Rummy Tournament of Champions during the late 90s. Harry "Yonkie" Stein, a renowned big-money player from Canada, regarded as one of the top players of his time. John Hainline, a greeting-card distributor from San Francisco who has won more than 30 gin rummy tournaments and is considered among the best players after Stu Ungar's death. Norman Ginsberg Pore, a strong player from Nevada.